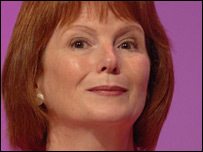 Hazel Blears has said she "does not recognise" a bishop's comments that Islamic extremists were making some areas "no go" for non-Muslims. The communities secretary said the Rt Rev Michael Nazir-Ali's comments were "pretty unhelpful" and he should spell out which areas he was talking about. Extremists were a "tiny minority" who must be tackled head on, she said. The bishop told the BBC there should be a public affirmation of the "Christian roots of British society". His comments in the Sunday Telegraph, that non-Muslims might find it difficult to live or work in some places where there was "hostility", have been criticised by some Muslims and politicians. The Church's Bishop for Urban Life and Faith, the Rt Rev Stephen Lowe, told BBC Radio 4's Today programme: "I have not seen these sort of areas. "There are, no doubt, as there are in all faiths, some people of extreme persuasions. "But the vast majority of the Christian and Muslim populations that I know are working happily together." Ms Blears told the same programme she was proud that Britain was a "secular democracy" with a strong tradition of allowing people freedom to worship in their own way. She said: "I don't recognise the description that he's talked about no-go areas, and people feeling intimidated, and people feeling hostile to each other. "If there are those areas, then maybe he needs to be a bit more specific about where he's talking about." She said government policy in housing, schools, in citizenship education, for children and young people, not translating so many documents, was about integration. "We do need to tackle extremism in all its forms.. but I do not recognise the picture the bishop has painted." Dr Nazir Ali, the bishop of Rochester, was quoted in the Sunday Telegraph as saying there had been attempts to "impose an 'Islamic' character on certain areas", for example, by amplifying the call to prayer from mosques. A worldwide resurgence of Islamic extremism had also turned "already separate communities into 'no-go' areas," he said. In a separate interview with the BBC, he said "Britishness" had to be recovered if it was to "have the identity to face another highly organised ideology, perhaps for the first time since the disappearance of Marxism". He said the government's approach to multiculturalism was wrong, adding: " I think an affirmation of the Christian roots of British society would actually provide a better way of affirming other people than the sort of secular all-faiths-are-the-same kind of route. "Because the secular approach will in the end marginalise everybody."